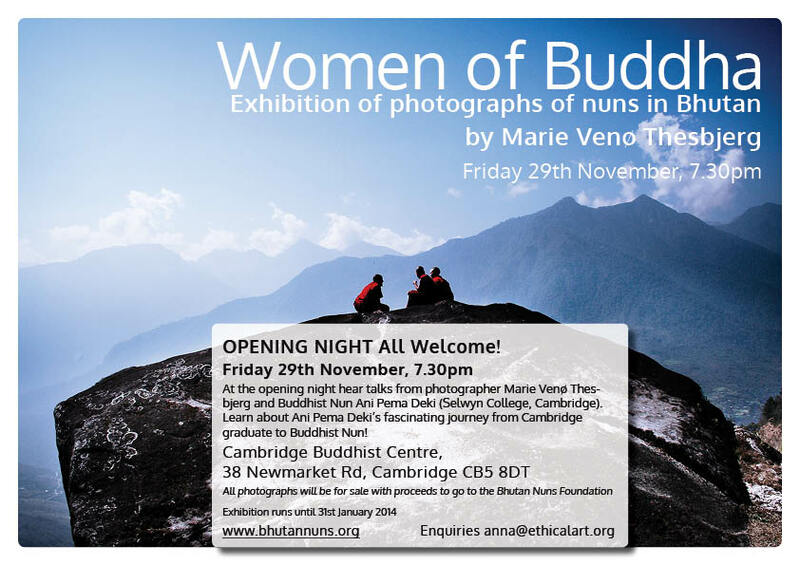 Opening 29th November 2013 and running through January 31st 2014 is an exhibition of photographs documenting the life of Buddhist nuns in Bhutan by Danish photographer and author Marie Venø Thesbjerg. The exhibition is raising funds for the Bhutan Nuns Foundation, which is the sole organisation in Bhutan helping nuns and nunneries in remote areas of the country. The opening night, Friday November 29th 7.30pm will feature talks by photographer Marie Venø Thesbjerg and Buddhist nun Ani Pema Deki. Marie Venø Thesbjerg visited the Kingdom of Bhutan in 2005 while working for an international aid organisation and fell in love with the culture and its people. Bhutan promotes the unique concept of Gross National Happiness (GNH) over Gross National Product (GNP), and while ranking 140 on the United Nation’s Human Development Index comes in at 1st place in terms of happiest countries in Asia and 8th in a world survey. Women of Buddha captures the unique experience of Buddhist nuns practicing in geographical and cultural isolation from the rest of the world. The nuns focus neither on materialistic goods nor on status in society, or a busy career. They concentrate solely on developing themselves for the benefit of others. Venø Thesbjerg’s candid photographs capture the simple, dedicated and extraordinary lives of these women following the teachings the Buddha gave 2500 years ago. All photographs will be for sale with all proceeds going to the Bhutan Nuns Foundation. At the opening night Buddhist Nun and former Cambridge graduate Ani Pema Deki (formerly Emma Slade) will also be speaking about her experiences in Bhutan and the path that has led her to become a Buddhist nun. Find out about the unique journey that has taken her from working in Investment Management in New York, London and Hong Kong to meeting her Lama (teacher) and spending much of her time now studying in Bhutan. She is currently taking her life vows as an ordained Buddhist nun in the Bhutanese tradition. What is the Bhutan Nuns Foundation? What is the exhibition aiming to do? Raise awareness and funds for the Bhutan Nuns Foundation through the exhibition and sale of photographs to improve living conditions and access to education for nuns in Bhutan.